Becton Dickinson BD FACSAria Fluidics Cart for Flow Cytometer Waste Reagent . New Life Scientific, Inc.
* In good cosmetic condition, minor wear and age in the back. This fluidic cart belongs with a BD FACSAria cytometer (not included), and houses all the reagent/waster reservoirs, hoses and the serial cable. Our on-site New Life Scientific technicians visually inspected but did not test the equipment for functionality. It was powered on and the technicians noted that the vacuum pump did engage. "A separate fluidics cart supplies sheath and cleaning fluids and collects waste from the instrument. The self-contained fluidics cart supplies the required air pressure and vacuum, which eliminates the need for an external source (although the cart can be hooked up to an in-house air source, if one is available). The air pumps provide pressure from 2 to 75 psi to accommodate a variety of cell sorting applications. Air pressure is adjusted within BD FACSDiVa software. The fluidics cart holds four 10-L containers (two sheath and two waste), and three 5-L auxiliary cleaning fluid containers (Figure 1-3). All containers, caps, level sensors, and tubing are autoclavable. The cart can also accommodate up to two BD FACSFlow™ 20-L cubitainers in place of the four 10-L containers. 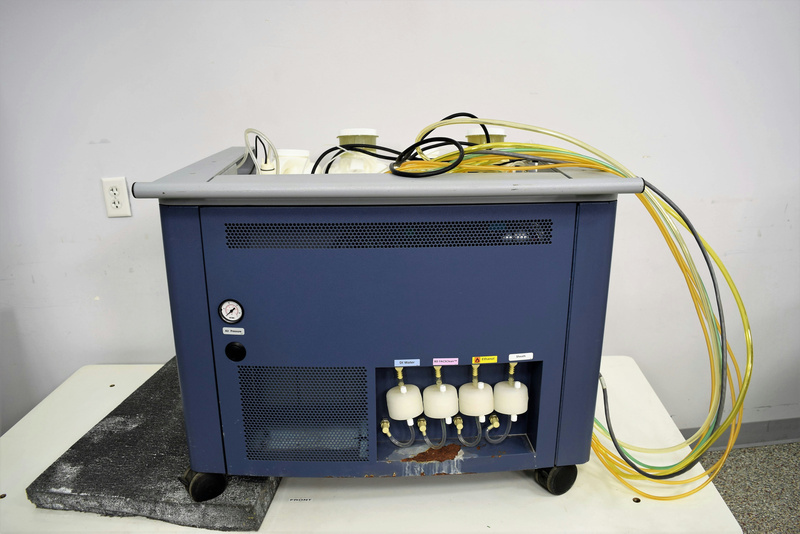 The fluidics cart connects directly to the flow cytometer unit via a power cord, fluid hoses, and air line. Receptacles for the aerosol management and temperature control options are also located within the connection panel. The position of the fluidics cart is constrained only by the length of the power cord and fluidics hoses, which extend up to 8 feet (2.4 m). Typically, the cart is placed to the left or underneath the cytometer."